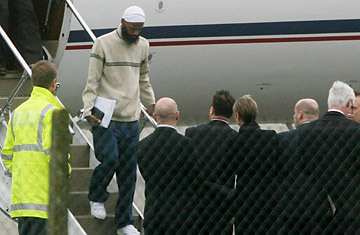 Binyam Mohamed, a British resident who claims to have been tortured by US interrogators, arrives in the United Kingdom in February after being released from Guantanamo Bay. From Prime Ministers to pop stars, terror suspects to teenage tearaways, Scotland Yard has questioned them all. But the request by the British Attorney General that the London police launch an investigation into MI5, the U.K.'s domestic security service, is unprecedented. At issue are claims by Binyam Mohamed, a former Guantánamo detainee, who alleges that British intelligence agents knew he was being held and tortured in prisons in Pakistan, Morocco and Afghanistan, and even supplied questions to his interrogators. It is unclear how much cooperation Scotland Yard can expect when it comes knocking on Washington's doors. Mohamed, an Ethiopian-born British resident who was held in Guantánamo from 2004 until this February, failed in U.K. court bids to obtain evidence about the U.S. role in his treatment. The documents were withheld on the basis that disclosure would endanger future intelligence sharing by America and Britain. Campaigners see no discernible shift in this stance since President Obama took power. Stafford Smith says there is "reticence in the Obama administration to turn over all these stones." The CIA declined comment on the Scotland Yard probe. But at least one U.S. Congressman would support the investigation. Bill Delahunt, Chairman of the Subcommittee on International Organizations, Human Rights and Oversight, says U.S. authorities should cooperate fully in any British investigation. "If there were violations of treaties or domestic law, that has to be revealed. That's my position and it's shared by other members of Congress," says Delahunt, a Democrat. "Obviously given the special relationship [between the U.S. and the U.K.] and given the fact that our security services often times work together, if there is information it ought to be made available to the British authorities." In an unexpected twist, Stafford Smith now faces possible imprisonment himself. The British lawyer has been summoned with his Reprieve colleague Ahmed Ghappour to appear before the Columbia District Court on May 11, to answer a complaint of "unprofessional conduct" lodged by the Pentagon's Privilege Review Team (PRT). If found guilty in what amounts to a contempt charge, Stafford Smith and Ghappour face up to six months in prison. The case revolves around a letter sent by Stafford Smith to Obama, and published in February by media on both sides of the Atlantic. The letter details Mohamed's allegations of U.S. involvement in his torture and rendition. In it, Stafford Smith says that as "U.S. lawyers with appropriate security clearances we have access to this classified material" and adds that a memorandum setting out the evidence will be attached. "We will send you only what we are allowed to send you," he writes. The attachment is a memo, blacked out but for date, sender and subject line: Torture of British resident Binyam Mohamed by U.S. personnel. This apparent censorship is anticipated by Stafford Smith in the letter. "You should be aware of the bizarre reality of the process under which we operate: That you, as Commander-in-Chief, are being denied access to material that would help prove that crimes have been committed by U.S. personnel," he wrote to Obama. The irony, Stafford Smith tells TIME, "is that the U.S. government is covering up evidence of torture and somehow they see fit to prosecute me for not revealing the evidence of torture." A member of the PRT, which monitors communications between Gitmo detainees and their lawyers, gives a very different account in a declaration to the court. The PRT member says Ghappour was advised that the PRT was not the right body to review a memo to the President. According to the declaration, "Mr Ghappour left my office at that point but subsequently returned with a heavily redacted memorandum ... Mr Ghappour asked me if the PRT could review this memorandum. Because this was a very unusual submission, I asked him what the point of reviewing such a document would be. He replied that he wanted to use the memorandum to demonstrate to Mr Mohamed that he (i.e., Mr Ghappour) was working on Mr Mohamed's case." The PRT member says that on the basis of "Mr Ghappour's stated rationale," the memo was marked "unclassified." Its subsequent publication along with the letter, which had not been submitted to the PRT, demonstrates a manipulation of "the Protective Order's procedures in order to deceive the press and the public about the role of the PRT," says the declaration. The signature and printed name of its author have been removed  redacted to protect identify of Privilege Team Member," according to a note. Just as Scotland Yard's investigation into MI5 is without precedence, this is the first contempt case brought by the PRT. Privately U.S. officials are angry about what they see as a publicity stunt. Delahunt makes no comment on the case, but says Stafford Smith "has demonstrated again and again integrity and respect for the law ... Defense counsels probably have one of the most difficult and unpopular tasks in any democracy," he adds. "If they didn't take their role seriously and aggressively, then democracy wouldn't function." The substance of Mohamed's claims, which lie at the heart of this twisted tale, is that at least for a time, the U.S. and U.K. democracies ceased to properly function. See pictures of the British police.